Ladies and gentlemen: please welcome State Maps to the stage. For if it’s cool indie rock jams you want then look no further than the unsigned group’s new debut album, Killer Hill Day. The rock quartet is here to make a lasting impression and from what I’ve heard so far I don’t see them fizzling away. The overall concept of the album strikes superficial similarities with the work of popular group, Wilco with authentic undertones of classic rock. 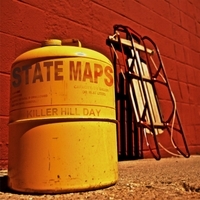 Balancing drums, guitar, bass, organs, and a variety of carefully positioned noises and alterations, State Maps does very well to establish a sound that sticks in the corner of your head. After just one listen, curiosity leads one back. A complete album is hard to find these days—one that flows from beginning to end. Killer Hill Day does not disappoint. State Maps, I’m happy that we can get acquainted. For a quick taste, to test the tempestuous waters of the vast foreboding world of “new music,” jump to title track, “Killer Hill Day.” Rest assured, it grooves and suggests toe-tapping. The organ adds an especially fond flavor to the chorus, a piano and drums guide you through seamlessly to the end, and the signature throaty vocals of the group are best exhibited here. For further listening, “John Cazale,” sounds like a track from a past era but in all the best ways. Again, this is a track which beckons familiarity with the work of Wilco. And the claps are rad. The very next track, following “John Cazale,” adds a little artistic dissonance and dance-ability that at least one track on a Indie Rock album should have. Further listening: “The Piping’s Standard” is a wonderful song. It manifests the same sorts of feelings I get from the Grateful Dead or the Steve Miller Band, personally, communicating that very same easy-going attitude. Don’t stop there and don’t just listen to the tracks mentioned here, however. You’ll find that a complete listen is most rewarding. I give Killer Hill Day two thumbs up. It’s a great revamp of classic rock notions and has a uniquely impressive quality to it. State Maps sound like grizzled veterans. My guess is you’ll start hearing this album quite a bit in a short time. For now, listen to it before everyone else. You’ll be the coolest kid on the block.